Abele Arabians - Arabians and breeds made up of mostly Arabian blood like Pintabians and Araloosas. Prefix is AB. Skyline Sport Horses - All warmbloods not including Trakehners, and other types of horses like saddle, drafts, ponies, stocks, grades and more. Prefix is SSH. Timber Top Trakehners - Literally just Trakehners. Nothing else. Prefix is TMBR. BIY - Breed It Yourself. Using one or two of my horses to create a horse. Files will not be given but screenshots of horses may be provided. The horse will be carry YOUR prefix. No activity requirements but seeing the horse after it's created would be cool. Partial BIY - Like BIY but a little different. 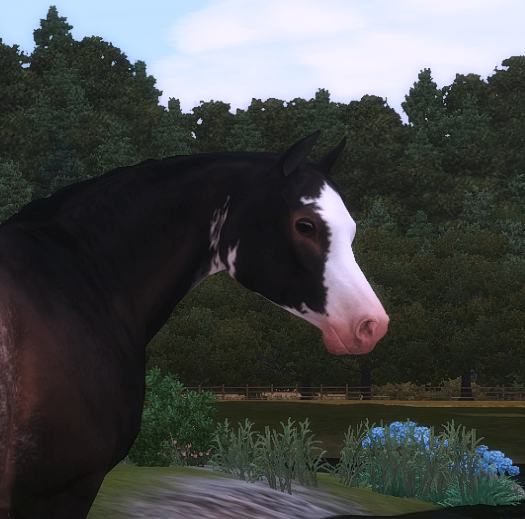 I breed two horses in CAP using the play with genetics option. Horse will be sent with a rough conformation and blank coat for the new owner to make on their own and tweak to their desired liking. This is NOT a template to be used over and over again. This is a legitimate offspring to be created and used ONCE. Horse can carry my prefix or yours but not both. No activity requirements but again would be cool to see end result. Traditional - I breed two horses in CAP using the play with genetics option. I create the conformation and coat (randomized or chosen by owner). Horse is sent to new owner and to be registered with one of my prefixes. I don't have horse credits to spare or I would offer to make profiles for you. I retain one copy of the horse in case the file is lost or needs updated. Minor tweaks can be made but please don't make drastic changes; like a different gender or coat color entirely. Custom markings are not an option. Public markings will be used but can be replaced or left off for custom ones to be used. No activity requirements, but scrapbook updates and C show entries are fun to see and make me feel proud! Even pictures sent through slack are awesome to see. Stud and brood fees are negotiable for members having $50,000 or less at the time their application is submitted. Only one offspring should be created regardless of service used. No twins please. If you want to re-sell the horse you can offer them back to me or sell them forward. I am more inclined to buyback Trakehners than other breeds. Offspring should not be uploaded for public download or sold for real life currency. If you are planning on going on extended hiatus (1yr or longer) profiles can be sent to me or the reclaims account without judgement. I would like to see my horses in active homes is all. Members can only buy 1 slot of each horse offered for breeding. BIY horses can be created once correct payment is sent. BIYS and Partial BIYs can have offspring registered in both Open and Verified colors. I'm not looking for trades or other forms of payment at this time. Drakkar Noir ET - Hanoverian. Foals receive +8 in Show Jumping. 0/3 slots. $12,000. UD Wynton - Hanoverian. Foals receive +11 in Eventing. 3/3 slots. $15,000. TMBR Rhinegeist - Trakehner (T). Foals receive +9 & +8 in Show Jumping & Dressage. 0/3 slots. $24,000. GATE's Escalade - Trakehner (T). Foals receive +9 & +4 in Show Jumping & Eventing. 2/3 slots. $20,000. TMBR Empyrean - Trakehner (T). Foals receive +13 & +8 in Show Jumping & Eventing. 2/3 slots. $27,000. WRNGS Black Coffee - Hanoverian. Foals receive +12 in Eventing. 0/3 slots. $14,000. SAEC Billy Flintstone - Thoroughbred. Foals receive +9 in Show Jumping. 0/3 slots. $11,000. TMS Sensitive Prince - Trakehner (A). Foals receive +6 in Dressage. 0/3 slots. $6,000. WPW Jasper - Crabbet Arabian. Foals receive +3 dressage. 1/3 slots. $6,000. SSH Jetliner - Thoroughbred. Foals receive +2 in Show Jumping & Eventing. 4/5 slots. $8,000. SSH Telltale - Anglo-Arabian (AHA). Foals receive +2 in Eventing. 3/5 slots. $4,000. TMBR Rhaego - Trakehner (T). Foals receive +9 in Dressage & +4 in Eventing. 0/2 slots. $15,000. Sensation REC - Hanoverian. Foals receive +9 in Show Jumping. 0/1 slot. $12,000. Song of War SHS - Thoroughbred. Foals receive +5 in Show Jumping. 0/1 slot. $8,000. NA Golden Opportunity - Anglo-Arabian (AHA). Foals receive +6 in Eventing. 1/1 slot. $6,000. TMBR Eponine - Trakehner (T). Foals receive +4 in Show Jumping. 0/1 slot. $8,000. TMBR Europa - Trakehner (T). Foals receive +14 in Show Jumping. 0/1 slot. $19,000. AvA Naaylah - Arabian. Foals receive +6 in Dressage & +1 in Liberty. 0/1 slot. $9,000. WPW Sonderlust - Crabbet Arabian. Foals will receive +11 in Endurance & +9 in Eventing. 0/1 slot. $27,000. WPW Oh Wonder - Crabbet Arabian. Foals receive +3 in Endurance & +4 in Eventing. 0/1 slot. $14,000. WPW Asteria - Shagya Arabian. Foals receive +3 in Endurance & +3 in Eventing. 1/1 slot. $13,000. Cinnabar's Captivation - Crabbet Arabian. Foals will receive +7 in Endurance & +9 in Eventing. 1/1 slot. $21,000. TMBR Rosalina - Trakehner (T). Foals will receive +4 in Dressage & +9 in Eventing. 1/1 slot. $19,000. DPPR Pawn of War - Thoroughbred. Foals will receive +9 in Show Jumping. 0/1 slot. $12,000. Monachyle's Scarlette - Trakehner (T). Foals will receive +3 in Show Jumping & +2 in Eventing. 0/1 slot. $10,000. AvA Wonderium - Arabian. Foals will receive +8 in Dressage & +6 in Eventing. 1/1 slot. $19,000. Ygritte ZI - Trakehner (E). Foals will receive +11 in Dressage. 0/1 slot. $14,000. ART Dalisay - Pintabian. Foals will receive +3 in Dressage & +1 in Endurance. 0/1 slot. $8,000. WPW Aubade - Crabbet Arabian. Foals will receive +2 in Dressage & +1 in Endurance. 0/1 slot. $6,000. TMBR Conquista - Trakehner (T). Foals will receive +3 in Dressage. 1/1 slot. $6,000. WPW Aurora - Crabbet Arabian. Foals will receive +1 in Dressage & Liberty. 0/1 slot. $4,000. WPW Rosemary - Crabbet Arabian. Foals will receive +2 in Dressage & in Eventing. 1/1 slot. $8,000. DPPR Invisible Killers - Trakehner (E). Foals will receive +5 in Show Jumping & Eventing. 0/1 slot. $14,000. Supernova AT - Thoroughbred. Foals will receive +2 in Show Jumping & +1 in Eventing. 1/1 slot. $6,000. Any comments, questions, or mistakes can be posted to this thread. Now open! "Can this service be used for existing horses already?" Yes! "Is a traditional breeding more expensive than BIY or partial BIY?" Nope! It's all the same price. "Can this serviced be used for horses that are not going to be owned by me?" i.e a gift, import, ect... Yes, but please make sure it's okay with the member if you are using their horses. Showing off the two traditional requests in case anyone is hesitant about applying for one. 3 more traditional breeding requests done!